I am so excited to announce my new security product that I have been working on for a long time, Automatic Playbook Testing. It is based on the ideas in this blog post and the ideas that I have been talking about for a long time. 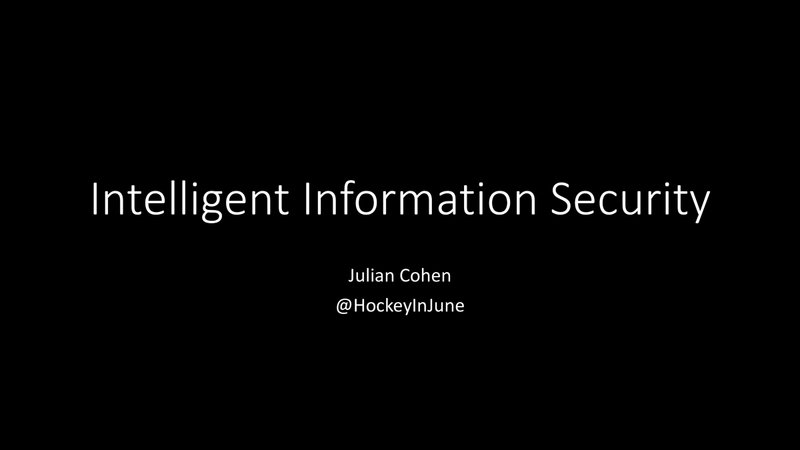 I have given this presentation at RSA (pdf), NCC Group Open Forum, and Hushcon (pdf). Today we’re going to talk about why we should re-evaluate how we secure applications, networks, and organizations. I’ll be suggesting that major parts of our security industry make significant shifts in how we think and operate in order for all of us to be more effective. I know that a lot of this is controversial and I know that most people will disagree with the majority of these points. 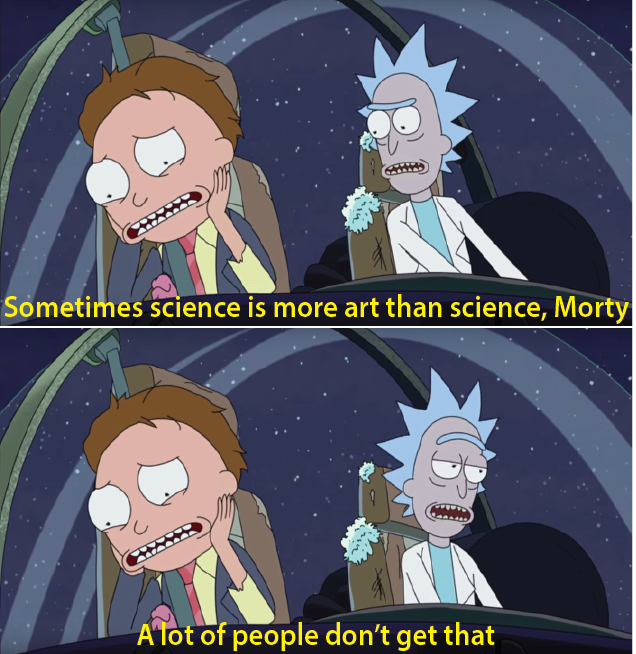 I simply ask that you listen to these ideas with an open mind. Here are some things about me that are supposed to convince you to trust my judgement. Security is not special, it’s simply in its infancy. Let’s start with an anecdote from a parallel universe, the medical industry. 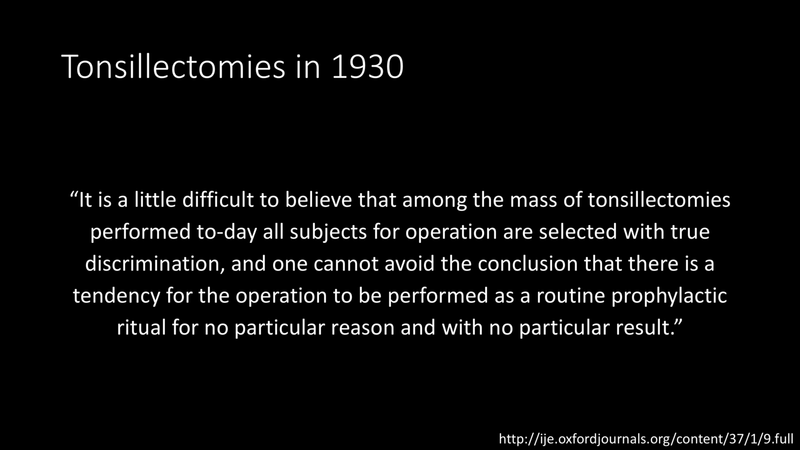 In 1930, a doctor named J. Alison Glover grew suspicious of the rate and success of a common operation, the Tonsillectomy or the removal of the tonsils. He found that tonsillectomies were three times more commonly performed in wealthier neighborhoods, often without adequate cause. He found that the procedure was often performed without sufficient regard to the possibility of the enlargement of the tonsils being temporary, physiological, or immunological. He could not find any correlation between the number of operations and any environmental factors, stating that it defies explanation, except that of different medical opinions between professionals. Starting to sound familiar? It should, because this is what the security industry does. In 2010, Haroon Meer gave a presentation at 44CON called Penetration Testing Considered Harmful where he discussed the failure of the penetration testing industry in depth. Haroon goes through a number of reasons why penetration tests are ineffective and he calls the industry a market for lemons. The original economic paper by George Akerlof states that any market with asymmetrical information will incentivize sellers to sell poor quality goods over high quality goods, eventually leaving only lemons in the market. Buyers don’t know what they’re getting in the penetration testing market. 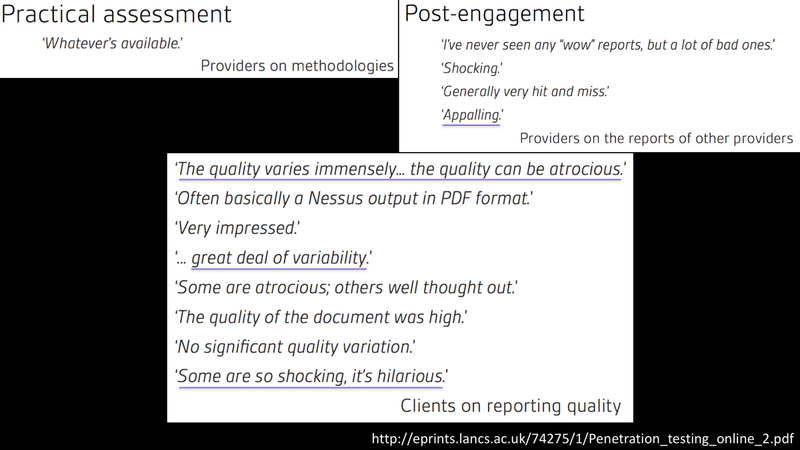 For instance, if a buyer receives a report with a low number of findings, it could be because the testers did nothing or because there are actually a low number of vulnerabilities to be found. Often, the customer can’t tell the difference. Penetration testing avoids highly likely attacks because the vulnerabilities that our penetration testers discover are not the vulnerabilities that real attackers discover. In order to figure out what vulnerabilities real attackers find, we need to talk about attackers. 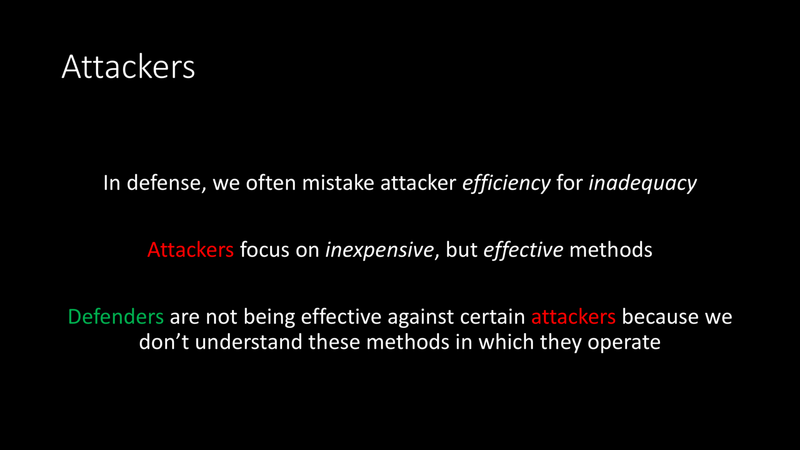 Almost everything you know about attackers is wrong. Defenders are constantly making bad assumptions about attackers, defenders rarely understand attackers, and defenders are not profiling attackers correctly. Resourced Attackers — APT1 is often talked about as one of the largest cyber espionage organizations on the planet. If anyone has resources it’s them, but Mandiant says that they use spear phishing to break into organizations. 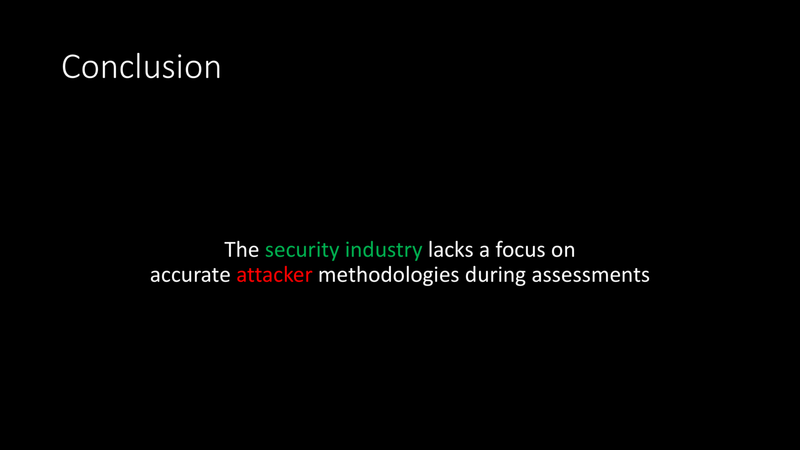 Resourced attackers aren’t necessarily sophisticated. 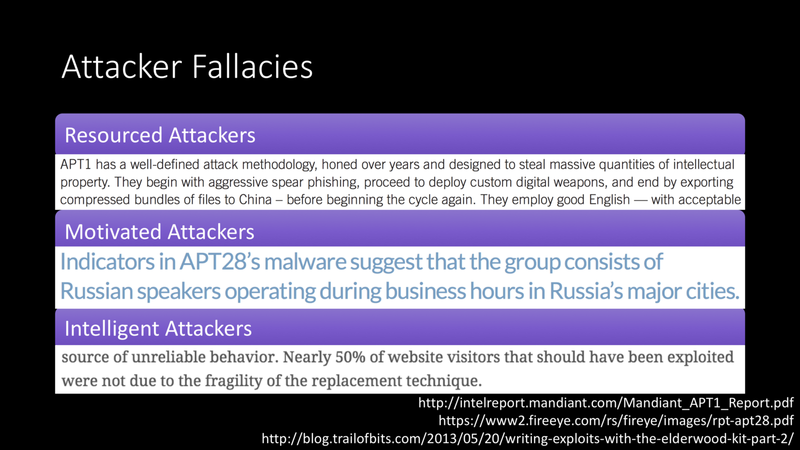 Motivated Attackers — APT28 is a massive group that operates out of Russia, but Mandiant has never observed an action taken by them outside of Russian business hours. They work strictly 9 to 5. Attackers are rarely as motivated as we assume. Intelligent Attackers — This snippet describes a previously unknown exploit for Internet Explorer written by the Elderwood group. The exploit is successful 50% of the time, only on machines that were built to be exploited by their exploit. 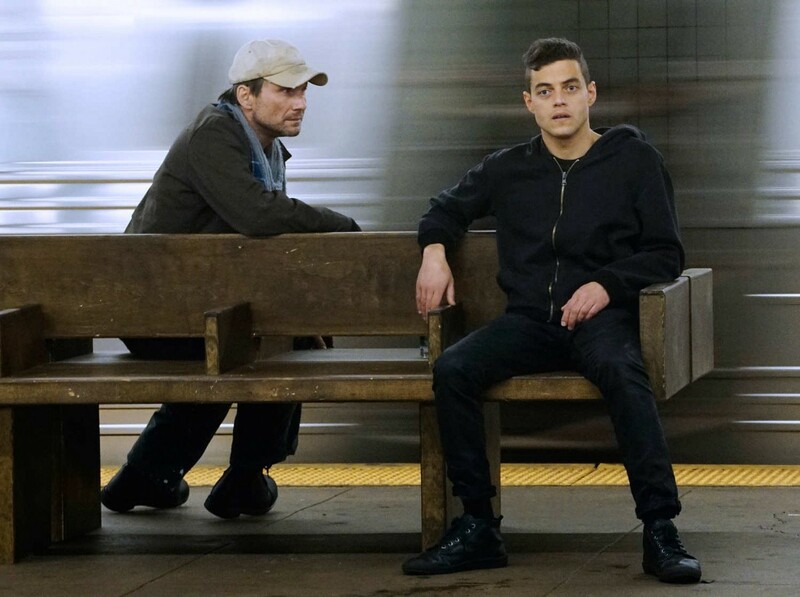 Sophisticated attackers aren’t always as sophisticated as we assume. These insights come from offensive expertise. Not penetration testing, but real attackers, under operational constraints. Just like penetration testers know the techniques to find the slickest bugs and the best findings to build a good looking report, attackers know the techniques to scale their attacks to pop the most boxes in the shortest amount of time. 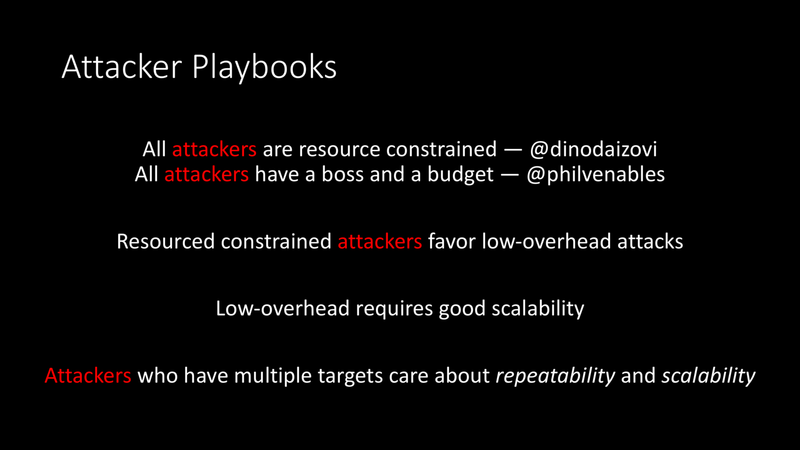 To achieve low-overhead and scalability, attackers create playbooks. Attackers that have multiple targets care about repeatability and scalability. Repeatability — The capability to change the target and have the attack still work with the same success rate. Scalability — The capability to launch the attack against multiple targets with minimal cost per additional target. At penetration testing companies, all employees are treated as experts. Consultants are hard to fire because they are hard to replace. Information asymmetry means that customers don’t know if a penetration testing organization is being effective. Bad penetration testing organizations survive because some customers need to pay for tests to be compliant, these customers might not even read their report. When attackers are not being sophisticated, but still being successful, that’s market efficiency at work. I am not the first person to suggest that we’re looking at this problem the wrong way. 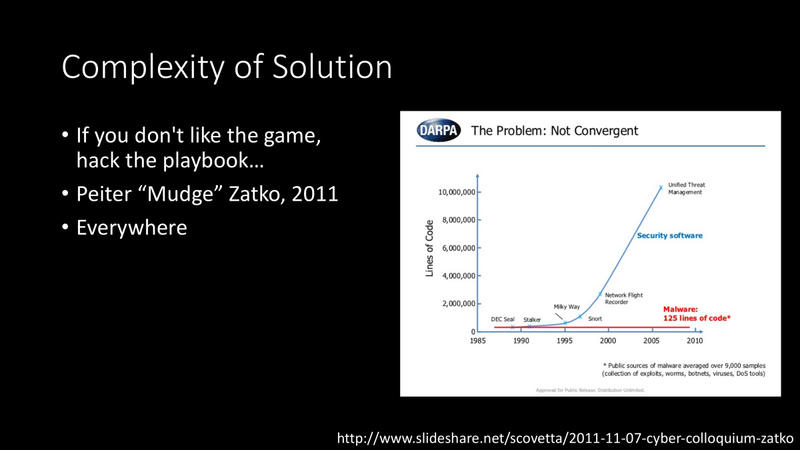 In 2011, Peiter “Mudge” Zatko gave a presentation called If you don’t like the game, hack the playbook… where he introduces DARPA Cyber Fast Track. Mudge says the complexity of attacks have generally not increased ever, while the complexity of defenses have skyrocketed. 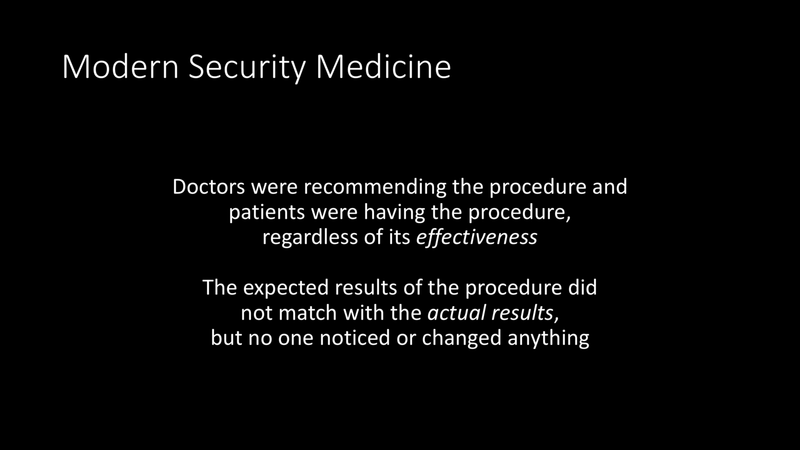 In 2011, Dino Dai Zovi gave a presentation called Attacker Math 101 (video) where he talks about how real attackers deal with different types of practical costs. 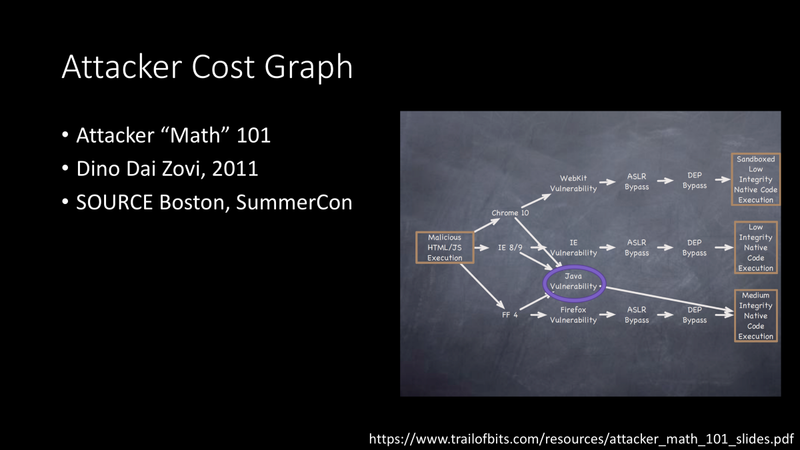 This cost graph describes the cost to exploit each of the major browsers and the permissions each vulnerability would yield (in 2011). Each node is an individual unit of difficult work, perhaps each requiring a different set of skills and tools. The Java path has the least number of nodes, affects every browser, and results in the highest privileges. 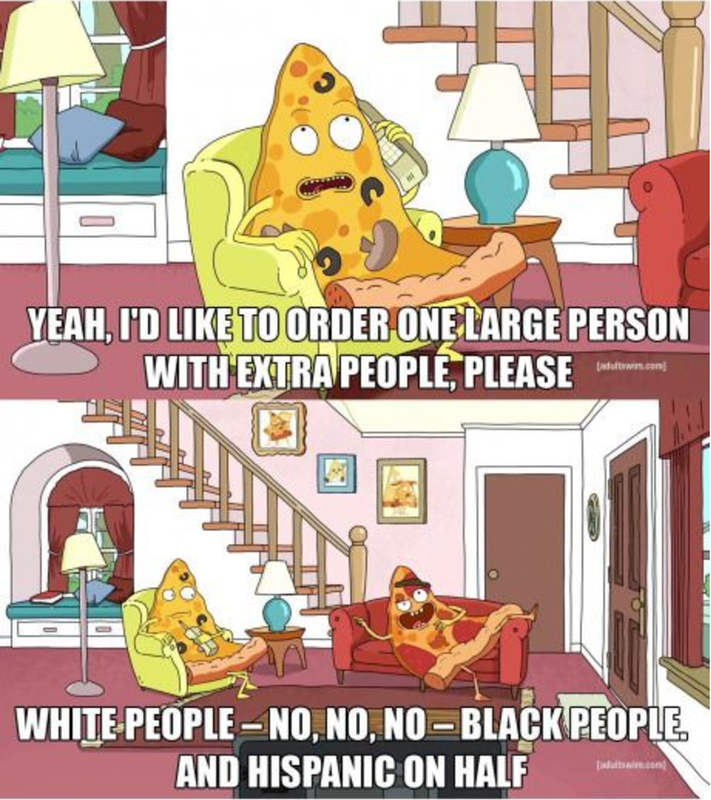 Get all three for the price of one, it’s the obvious choice. 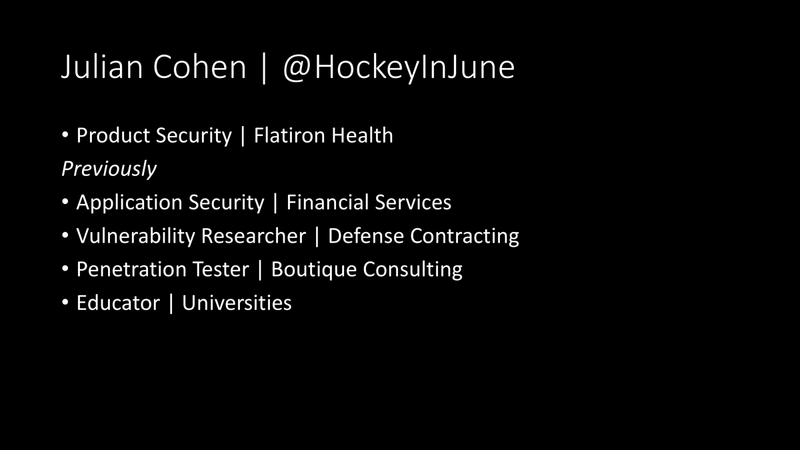 Now, I want to show you some case studies of how real attackers conduct operations. The Syrian Electronic Army used social engineering to successfully hijack the DNS records of The New York Times, Twitter, The Washington Post, The Associated Press, and The Financial Times. They built botnets with opportunistic known vulnerabilities and launched successful DDoS attacks against Al Jazeera, BBC News, Orient TV, and Al-Arabia TV. They used old hosted website-defacing techniques targeted at Israeli websites, anti-Asaad websites, American and British news websites, and did a lot of collateral damage to websites that were not news websites and did not contain content related to Syria or Palestine. ShadowCrew slowly stole credit card data from e-commerce websites. Because each SQL injection vulnerability used was unique, this campaign scaled very poorly. For example, Albert Gonzalez of ShadowCrew was charged with only breaking into 13 organizations over a period of 18 months, stealing about 140 million credit card numbers and a couple million dollars. FIN6 is a fairly large operation focused on stealing credit card information. Unfortunately, Mandiant and iSIGHT intelligence have very little reliable information about FIN6’s methods of initial compromise, but I would bet that FIN6 uses a handful of cheap methods for initial compromise including exploit kits, mass scanning, and including their malware in free software. In a rough estimate, FIN6 made around $400 million US dollars through April 2016, and it is estimated that FIN6 has been operating for the last 3–4 years. 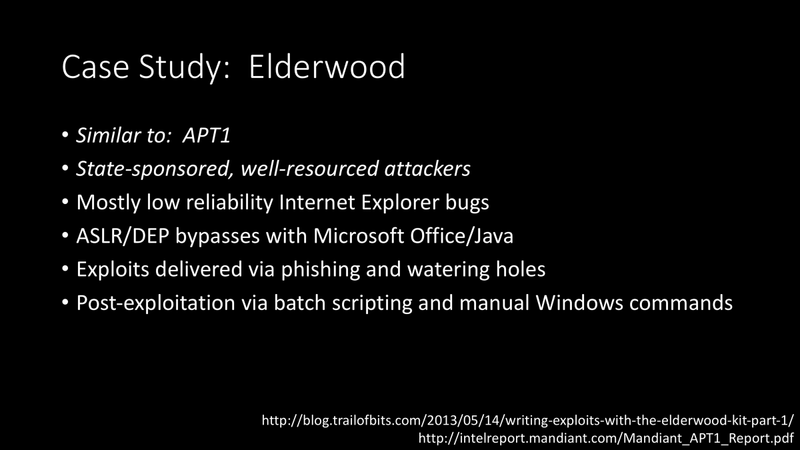 Elderwood is known for their watering hole and spear phishing attacks from 2010 to 2014. They typically use new vulnerabilities in their attacks, mostly use low-reliability Internet Explorer and Flash memory corruption vulnerabilities. It’s important to note that we don’t know if they use low-reliability Internet Explorer bugs because that’s the best they can do or because that’s all that’s required to achieve their objectives. I would bet on the latter. We need a new security strategy. Gartner, here we come. 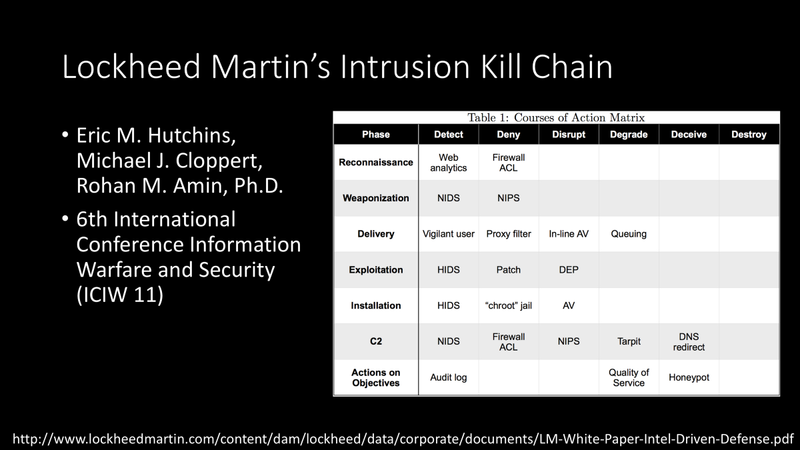 Finally, I want to introduce my six step plan to solve information security, which is based on Lockheed Martin’s Intrusion Kill Chain. Identify Attacker Groups — Similar to a threat modeling exercise, but where the focus is on which attacker groups target assets your organization has access to rather than how attackers could get access to those assets. Which target lists are you most likely to end up on? Profile Attackers — This is a real threat intelligence exercise, similar to what the best threat intelligence companies do, but with a focus on techniques and procedures. Obtain Key Tactics — Determine what the key techniques and procedures are, what is least likely to change, and the cost factors associated with them. 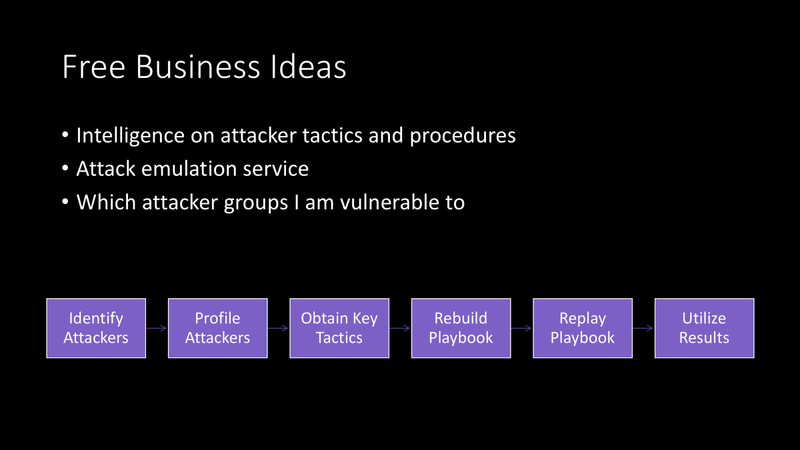 Rebuild Attacker Playbook — Based on these key tactics, rebuild the playbook as closely as possible. 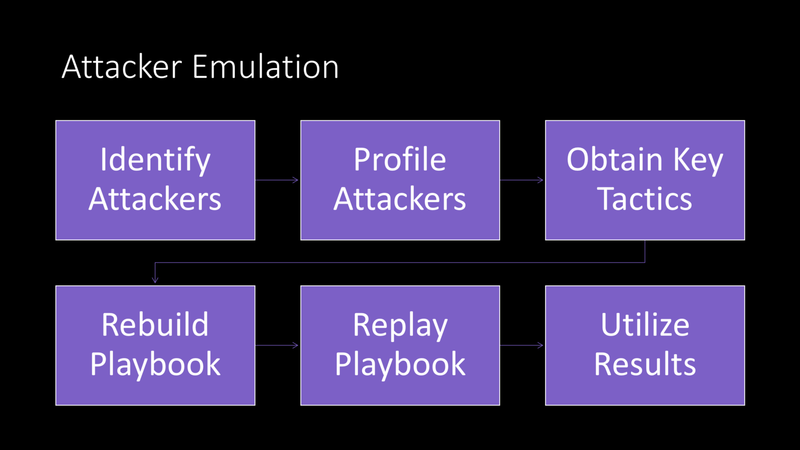 Replay Attacker Playbook — And play it against your organization. Utilize Key Results — Now you have useful, actionable results, use them throughout your security organization. 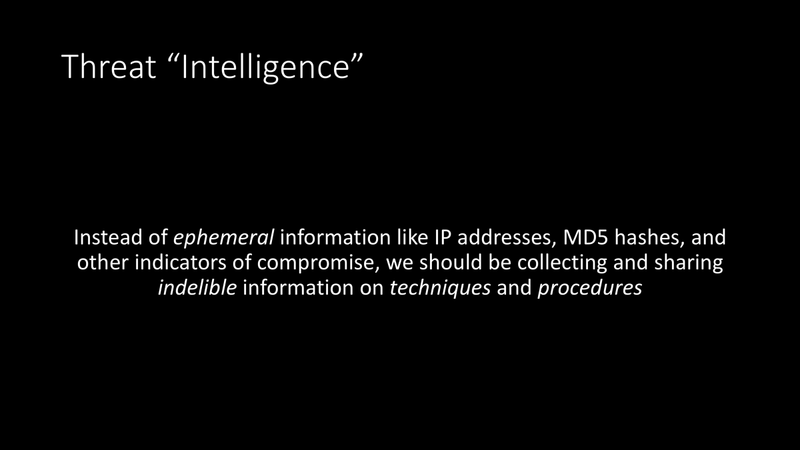 When done with the proper intelligence about attacker groups, your results will be repeatable, precise, practical, and effective. In the four case studies above we covered attacker intelligence insight into application security, infrastructure security, lateral movement, client-side security, endpoint security, reconnaissance, and social engineering. These detailed, specific attacker tactics are what security teams should be using to understand attacker playbooks and design effective defenses. This is what we’re missing from the defense solution space and this is what I want to to offer from Automatic Playbook Testing. I would like to thank Justin Berman, Nicholas Arvanitis, Chris Sandulow, Adam Zollman, and Marc Budofsky for helping me to turn these ideas into a reality within a real organization. Thanks to John Terrill and Chris Surage for dealing with me while I struggled to apply these ideas within an organization that would not budge. Thanks to Jordan Wiens, Doug Britton, Ted Fair, Hudson Thrift, Tyler Nighswander, Alex Sotirov, Erik Cabetas, and Chris Rohlf without whom I would lack the perspective required to solve these problems. Finally, thanks to Dino Dai Zovi, Dan Guido, and Brandon Edwards, for planting the seeds for this idea so long ago and giving me the courage to challenge the status quo in the security industry. Thanks to Justin Berman and Nicholas Arvanitis.